Earl Scruggs: The 2003 Fresh Air Interview Banjo player Earl Scruggs, who helped shape the sound of American bluegrass music, died Wednesday. He was 88 years old. Fresh Air remembers Scruggs with excerpts from an interview. Earl Scruggs onstage in 2007. 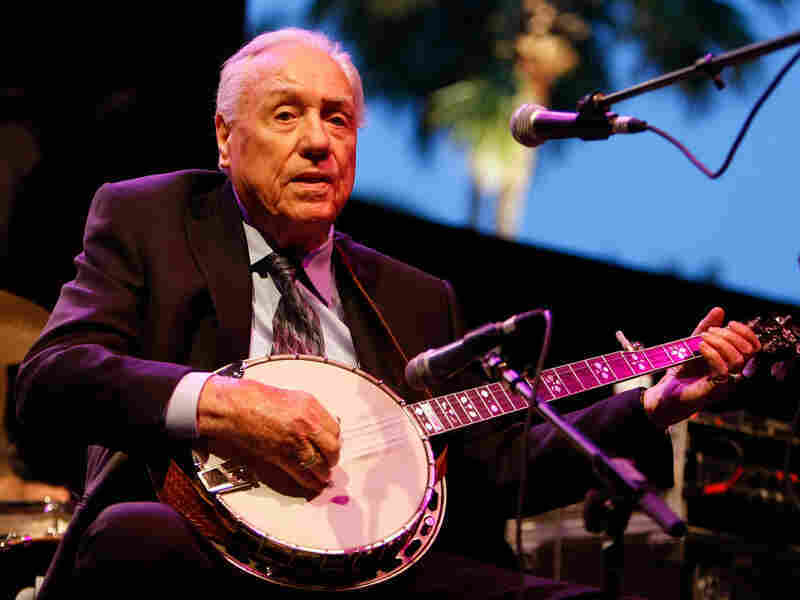 Banjo player Earl Scruggs, who helped shape the sound of American bluegrass music, died Wednesday. He was 88 years old. Scruggs' name is almost synonymous with the banjo — and for good reason. He helped pioneer bluegrass music with his three-finger style of banjo picking, a technique now known as "Scruggs style." His career in the bluegrass world spanned decades. In 1945, he joined Bill Monroe's band, a group that virtually invented bluegrass. In 1948, Scruggs and guitar player Lester Flatt left Monroe to form their own group, Flatt and Scruggs, which became one of the most popular acts in country music. Their hit "Foggy Mountain Breakdown" became even more famous when it was used on the soundtrack of the movie Bonnie and Clyde. They were also featured on "The Ballad of Jed Clampett," the theme song for The Beverly Hillbillies TV show. "We had a banjo in our home. My father played old-style banjo, so I had a banjo there, and my brother Horace had a guitar, and so we just started playing just old tunes that we'd heard before. And then a little later we'd got a Sears Roebuck radio and started listening to some — mainly the Grand Ole Opry and some programs like that. But as far as the style of banjo that I play, nobody had played it before me, and the only thing that is different from my playing and what I'd heard is that I had a three-finger roll that has later been called Scruggs style. It seemed to help me to play slow tunes as well as uptempo tunes. Most of the banjo playing in the old days were hoedown-type tunes, uptempo tunes." It produces the sound that my ear's looking for. Maybe I've just gotten used to it, but I like the sound that I get out of that particular banjo. I feel at home with it when I take it out of the case and start. "It's a little misleading to say three fingers. It's actually two fingers, middle and index finger, and your thumb, and it's kind of — some of the rolls will go, if you number your thumb one, the index two and your middle finger three, it's like a one-two-three roll, over and over. But to do a tune, it's like trying to say every word with the exact same amount of syllables in the word. You've got to alternate the rolls some to make the tune flow." "I was in what we called the front room with a banjo one day, and I was in the mode where if somebody had asked me what was I thinking about — I bet you've been in that mode yourself — you couldn't tell them what you was thinking about. You was just kind of sitting there, and I was picking the banjo, and I was playing a tune that I still play today called 'Reuben.' And when I realized what I was doing, I was playing the way that I play now. It was like having a dream and waking up, you was actually playing the tune. So that was the mode I was in and what I was doing when I learned exactly what I'm doing today." "It was terrible. If I hadn't have been 21 years old and full of energy, had just came off of a farm and a thread mill where I could — you know, I thought to do an hour show on the road was a pushover compared to eight hours in the mill or from sunup to sundown on the farm. And music was my love, so to get into a group that had good singing and playing, and Bill had that, especially good singing, and had a good fiddle player, so I went in, and it just seemed to make a full band, especially for that style of music. ... Why did I hate it? It was because we did it 24 hours a day practically. Back then there was only two-lane highways, and he traveled in a '41 Chevrolet car and we'd leave after the Opry on Saturday night and maybe work down south. Georgia was about as far as you could get for a Sunday afternoon show. And on down to Miami someplace for Monday or Tuesday and worked till about Thursday and started working back to Nashville. So it was just — you'd only be in Nashville long enough to do the Grand Ole Opry and to get a change of clothes and pack your suitcase and head out again. I was single at the time, so I was living in a hotel and had one suitcase and so it — I had to really work on it to keep clean clothes for every night doing a show on the road." "So anyway, we talked about that two or three times, and he ended up sending the pilot to Nashville for us to see. And after we looked at it, we thought, 'OK, that looks all right.' So they went ahead and recorded it, and while they were doing the theme music, I said to Perry Botkin, who was the music director at the time, 'I think that would make a great single.' And so I called Mr. Henning and I said, 'What do you think about them recording that for a single for Columbia Records?' and he said, 'I think it's a great idea.' So I spoke to their A&R director, Mr. Don Law, who was doing their records at the time, and so they recorded it three weeks later. And then on — it was released in October, and December 8th, 1962, it hit No. 1 in Billboard. "And it eventually ended up being shown in 76 countries around the world. So what it did actually insofar as spreading country music, it helped country music and it helped, well, the banjo in particular, because Earl gets mail from people all over the world." "It produces the sound that my ear's looking for. Maybe I've just gotten used to it, but I like the sound that I get out of that particular banjo. I feel at home with it when I take it out of the case and start — you know, when you start with another instrument, they all have their feel, and playing the same instrument, you know what it's going to feel like when you take it out of the case and start to perform."